Big Fish Little Fish – Family fun for the post-rave generation of parents. Helping parents be responsibly irresponsible since 2013. 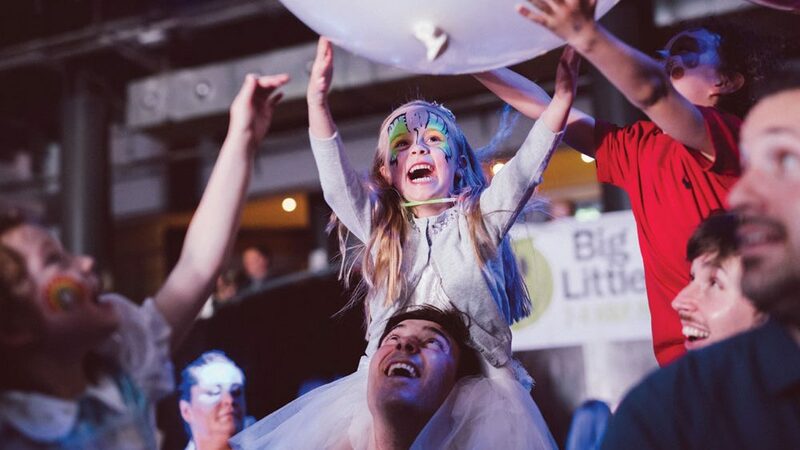 World-famous, award-winning, Glastonbury Festival performing, family rave sensation Big Fish Little Fish throw the ultimate pyjama & onesie party – No Sleep ‘Til Bedtime. Top DJ Mark XTC spins old-school sets with a mix of classic rave tunes on a multi-sensory dance floor with confetti cannons, bubbles, giant balloons and parachute dance finale. – Craft tables with themed crafts, large colouring-in mural and playdough tables. – Play area with tents and tunnels and baby chillout space with mats and soft-play ball pool. – Free transfer tattoos and glowsticks. – Facepainter stall and snacks available. Each member of your group must have a ticket and pre-walking infants free (but ticketed). To request a pre-walking ticket please email jay@glee.co.uk once you have made your booking. All tickets will cost more on the door and subject to availability. Join the Big Fish Little Fish mailing list here and keep up to date with everything that’s coming up!